For several hours each night before the Mormon Miracle Pageant in Manti, Utah, Mormon Tabernacle Choir music is broadcast over loudspeakers. One might hear popular Mormon songs like Come, Come Ye Saints (a pioneer song) or Praise to the Man (a tribute to Joseph Smith), among many others. These songs are expected. But one might be surprised, as I was, to hear the familiar strains of the beloved Christian hymn, Holy, Holy, Holy. I say surprised because Holy, Holy, Holy is a Trinitarian hymn; Mormonism denies the Trinity. This alteration is employed both times in the song where Mr. Heber wrote, “God in Three Persons, blessed Trinity.” I give the Mormon Tabernacle Choir credit for refraining from singing something the LDS Church says is “not true” (Jeffrey R. Holland, “The One True God and Jesus Christ Whom He Hath Sent,” Ensign, November 2007, 40). But this Mormon interpretation of the song, while only changing three little words, effectively eliminates the very heart of the hymn Reginald Heber penned. Reginald Heber wrote this song to praise the one true God – his God – Father, Son and Holy Spirit; three eternally existing coequal and coeternal Persons within the one Being that is God. The Mormon Tabernacle Choir removed that Being, that one true God about whom and for whom the song was written, and substituted a different god in His place. In His rightful place. Taking praises that belong to God alone and singing them to another. This, to me, is an illustration of the bigger picture of what Mormonism has done with the Bible and Christian doctrine. Mormons often say Mormonism is “so close” to evangelical Christianity. They think that the “few” and “little” differences Mormonism has with Christianity are mostly insignificant. But in reality, the Mormon interpretation of doctrines long-held and espoused by Christians, just like the three little words changed in Holy, Holy, Holy, effectively eliminates the very heart of the Christian Gospel. Is God One, a Trinity in His nature, or three Gods unified in Their purpose? Is Christ the Creator of all things in heaven and on earth or the older brother and non-creator of the spirit beings in heaven and on earth? Is salvation a gift from God given to sinners according to His great mercy or is it an achievement of those who prove themselves worthy? 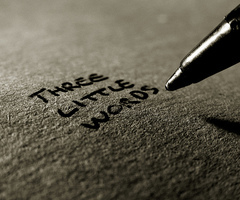 Three little words, three little changes (among many others that could be discussed). But a different God, a different Christ, and a different doctrine of salvation equal a distorted and different Gospel. And this is a very big deal indeed (Galatians 1:6-9). This entry was posted in Christianity, Gospel, Nature of God and tagged Manti Pageant, Mormon Tabernacle Choir, Trinity. Bookmark the permalink. Thanks for that quote. I get irritated when someone tries to split hairs instead of just putting the truth out there. If someone is afraid of the truths of Mormonism, maybe they should rethink things. Stop with the “no one knows Mormonism but a Mormon” bit. I was a Mormon and I didn’t know diddley squat! Just what was spoon fed to me at church and at home. Mormon missionaries don’t even tell the truth when they are trying to convert someone. You want the whitewashed, lying version to be told, I want the truth. Where better to find the truth than the mouths of prophets and leaders who have/had authority to speak on Mormon doctrines? You however do not have power and authority to say anything concerning Mormon doctrine, and your apologists will tell you so as they are throwing you under the bus. I don’t see anyone who shows what your past leaders have set out as doctrine as sensationalists. The teachings are there in black and white, you just choose to twist, spin or look the other way. You can’ t bear for Mormonism to false. No one here is bearing false witness by laying the teachings of Mormonism out for all to see. What are you trying to hide? Are you embarrassed by the teachings? I am. I’m embarrassed that I chose to follow these men instead of the true and living Christ of the Bible. I too followed a false Christ. There is such a difference in the Biblical Christ and the Mormon Christ. Please find him.